We love when the community gets creative with our soups. What about an Hart and Soul Coconut and Lentil Pie ? We were really impressed when we discovered Live Love Nourish ‘s recipe. Brilliant? Yes, Creative? Oh Yes ! Everyone please stand up and applaud the lovely Casey-Lee (@LiveLoveNourish) who transformed our all natural Coconut & Lentil soup into a creamy pie with a simple and healthy crust that will warm and nourish you from the inside out! HOORAY ! If you try a recipe and it does not turn out good, what will you do? Turn it into pie! Pop the disaster into a deep baking dish, top with a pie crust and bake in the oven until golden. Works most of the time! Being a foodie it has to be a recipe… either my gluten free apple crumble or my 4 ingredient banana bread. Add whisked egg, olive oil and salt and mix well. Shape with hands into a ball of dough and roll out to approx. 1 to 2cm thick between two pieces of parchment paper. 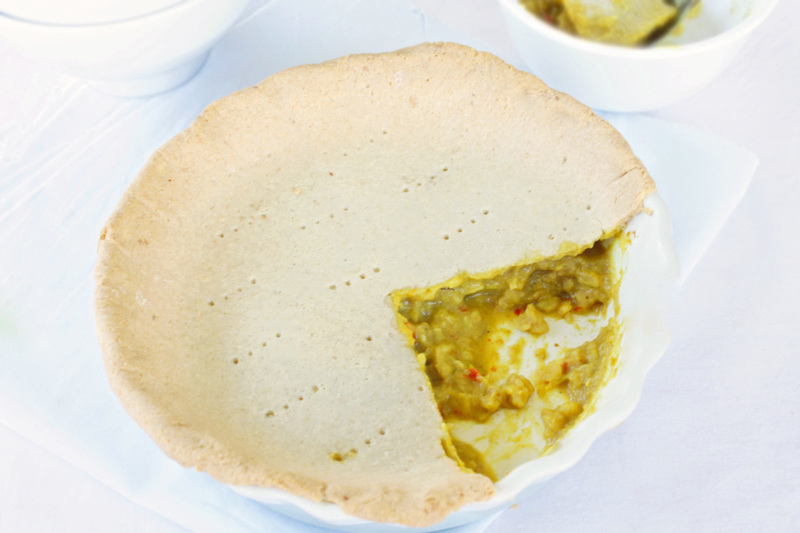 Pour the Hart & Soul Coconut & Lentil soup into a small pie dish and place the crust on top. Pierce several holes with a fork and bake in pre-heated medium oven for 30-35 mins or until lightly golden and crunchy. – This recipe makes a small pie. To make a large family size pie, double the ingredients. – If your dough is too sticky, sprinkle with a little extra arrowroot flour and shape with hands.